The return of “Cannibal: The Musical” at Magic Smoking Monkey Theatre is an appropriate addition to the Thanksgiving season. No need for stuffing as you chew on the hand or foot of your former friend. Inspired by the Donner Party, Trey Parker of “South Park” and “Book Of Mormon” fame has created a deliciously creepy and hilarious musical that incorporates a lot of humor (and even some characters) from that iconic television cartoon noted for its “bad” animation and irreverent situations and dialogue. 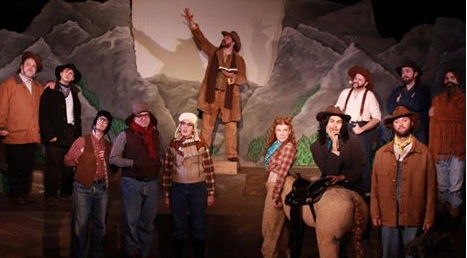 Led by Keith Parker as Alfred Packer, this merry band of mischief makers are led into the Colorado territory in hopes of finding gold but find untraditional (at best) fur trappers and other assorted characters instead. 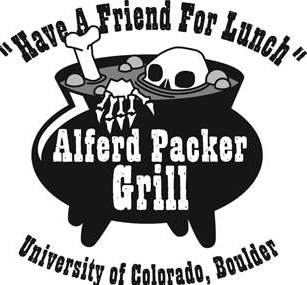 Parker’s Packer presents preposterous proposals for his posthumous friend after he is shot in anger and this leads to the classic reenactment of the Donner Party fiasco. Accompanied by his horse, Liane who, at times, seems to be a bit of a fickle filly, these two make a Wild West odd couple. Betsy Bowman Saule is a perky palomino with that gorgeous flowing red mane that peaks into appropriate ears. With only gestures and facial expressions, she gets her point across until a surprising appearance near the end of the play that’s as hilarious as it is a bit sad. Which came first- the eatery or the eaten? 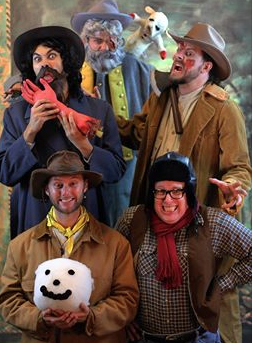 Join the zany cast of “Cannibal: The Musical” at Magic Smoking Monkey Theatre. A huge cast takes over the Ivory Theatre stage including a great performance from Ben Ritchie as the hot-headed and musical theatre nay-sayer, Frank Miller. Also standing out is Jeff Kargus as the mind-blowing Frenchy. Chris “Mr.” Jones, Eustace Allen, Patrick Kelly and Sean Green comprise the little band of nomads and Robbie Haupt and Andrew Weber follow their leader. Sarah Porter and Nicole Angeli stand out as the females involved in the hooliganism while Jaysen Cryer, Soupy Alan David, Mike Monsey, John Foughty and Chuck Brinkley round out the mainstream cast. Maxwell Knocke and Juan Schwartz get in on the fun while the two Stage Ninjas who open the show, change scenery and even take on iconic figures like Kenny, are played by Maria I. Straub and Abigail Lampe. All of this madness is made possible by Suki Peters at the director’s helm. She was recently named Artistic Director of St. Louis Shakespeare and, as a bonus, gets to continue the madness of their offshoot troupe, the Magic Smoking Monkey Theatre. Maria I. Straub choreographs a lot of the fast-paced lunacy on stage and Brian Peters is fight choreographer and has designed the highly effective set on the small stage. Beth Ashby’s costumes are a gem and Deech Mestel has lit the production appropriately. Jeff Roberts is responsible for the sound design and Bob Singleton has brought the video and motion graphics to life at the back of the stage including the wonderful opening sequence. Musical Director Patrick Blindauer has brought the silly but effective score to life with Larry Kornfeld setting down the music tracks. From “Shpadoinkle Day” to a lot of references to baked potatoes, it’s all a treat for the ears as well as the eyes. For those familiar with the crazy take-offs and satires rooted in Magic Smoking Monkey, the return of “Cannibal: The Musical” will be a welcome sight. For those yet to experience the insanity, plan a trip to this off-beat show before it closes on December 6th. This entry was posted on December 2, 2014 at 9:43 am12 and is filed under Uncategorized. You can follow any responses to this entry through the RSS 2.0 feed. You can leave a response, or trackback from your own site.